One of our core values is to focus on constant and never-ending improvement. We strive to consistently evaluate and evolve our offering to provide you with the most current product and best possible service. This quarter, we’ve made several exciting improvements and we want to highlight the top eight for you today! Facebook took the marketing world by surprise when they made a last-minute announcement that all business pages would be changed to the Timeline format on March 30th 2012. Shortly after the announcement, we built and launched two new packages – Starter and Premium – to make your switch to Timeline seamless so you don’t miss out on valuable Facebook leads and referrals. Click here to learn more about Z57’s Facebook Timeline for Business Solutions. 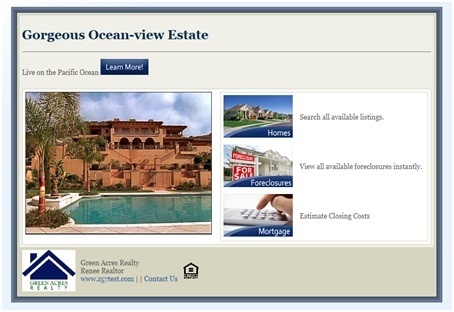 Your listings manager format has been streamlined to give you better control of your listings. Now, it is much easier to promote listings, create QR codes, identify active and inactive listings and delete expired listings. We’ve also added a timestamp to your listings which will show you the exact date your listing was added to your website. We have partnered with ClosingCorp to offer a you a more robust mortgage calculator. Ryan Whitlock, our CEO says, “While other calculators only provide monthly mortgage payments, ClosingCorp’s SmartClosing Mortgage Calculator provides accurate closing cost data that consumers need to gauge the real costs associated with buying a home. It takes local regulations and customs into account while using real, up-to-date rates to ensure the most accurate data delivery.” Your new and improved mortgage calculator also functions as a lead capture tool and is now available on your IDX listing pages, individual listing pages, your Mortgage Center page is a button within your craigslist postings. QR Codes, short for quick response codes, have become a popular marketing tool targeted specifically at appealing to an increasingly mobile market. QR Codes – a free tool – are now automatically generated for every listing within your Marketing Control Center and can easily be added to your printable fliers, business cards or any other offline marketing material. Smartphone users scan the QR Code and are sent directly to your listing or single property website. Your craigslist posting tool ads have never looked better! We updated the ads to include a more modern look and feel. Frequent engagement with the tools inside the MCC is crucial to your success and our goal is to make the Marketing Control Center your go-to portal for all of your marketing needs. We’ve added a “Last Login” tool to help keep you accountable for your MCC login frequency. Now, when you log in, you will see a date counter that shows you how many days it has been since your last login. We hope this will help keep you motivated in your marketing efforts and will ultimately lend to your success! We love to hear your feedback. If you have any suggestions or ideas on product or service enhancements, please send them to products@Z57.com As always, don’t hesitate to contact us with any questions by calling 800.899.8148 ext. 5 or by emailing us at customerservice@Z57.com. We look forward to continuing to provide industry leading product and service and we thank you for your business. Want to try these new features for yourself?